Revolution has broken out in the Forsaken Isles. The islanders have risen up to drive out the Inning Empire, but still they have no one to unite them. Only an Ison can do that--a leader whose heart has been cleansed by the curing of dhota-nur. The power to create an Ison lies in the hands of three people, and none of them are heroes. Spaeth has the ancient Lashnura heritage, but does she have the stature? Harg has the military genius, but he utterly rejects the price of dhota-nur. And Nathaway, the Inning outsider, finds himself unexpectedly holding the key to the future of the Isles. Perilously poised between Inning conquest and the savage powers of ancient forces, the Forsakens need them to decide. But for an Ison to rise, each of them must betray one of the others. Ison of the Isles continues the story started in Isles of the Forsaken. Carolyn Ives Gilman writes both fiction and nonfiction about frontiers. Growing up close to the U.S.-Canada boundary, she became a historian of borders between nations, races, and cultures, and a writer of fiction about even more exotic worlds than ours. 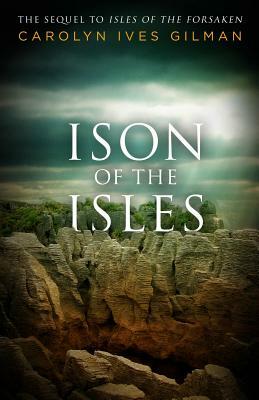 Carolyn Ives Gilman's most recent novel, Isles of the Forsaken, starts the story concluded in Ison of the Isles; it has been compared to the works of Mary Doria Russell and Ursula K. LeGuin. Her first novel, Halfway Human, was called "one of the most compelling explorations of gender and power in recent SF" by Locus magazine. Her short fiction has appeared in Fantasy and Science Fiction, The Year's Best Science Fiction, Bending the Landscape, Interzone, Universe, Full Spectrum, Realms of Fantasy, and others, and she has a collection of short fiction, Aliens of the Heart, from Aqueduct Press. Her work has been translated and reprinted in Russia, Romania, the Czech Republic, Sweden, Poland, and Germany. She has twice been a finalist for the Nebula Award. In her professional career, Gilman is a historian specializing in 18th- and early 19th-century North American history, particularly frontier and Native history. Her latest nonfiction book, Lewis and Clark: Across the Divide, was featured by the History Book Club and Book of the Month Club. Her history books have won the Missouri Governor's Humanities Award, the Missouri Conference on History Best Book Award, the Northeastern Minnesota Book Award, and the Outstanding Academic Book of the Year award from Choice magazine. She has been interviewed on All Things Considered, Talk of the Nation, History Detectives, and the History Channel. She is currently working on a history of the American Revolution on the frontier. Carolyn Ives Gilman is a native of Minnesota who now lives in St. Louis and works for the Missouri History Museum.